Abe, a cranky retired history professor who’s pretty good on the harmonica. Joanna, a flight attendant who’s logged plenty of miles but still has a ways to go before she can stay on the friendly ground. They’re an unlikely pair, and they maintain their separate residences, separate worlds, but sixteen years together have been good to both. They know when to be together, when to keep their distance, how to keep their lives in and around Seattle rolling along. Until one day. They don’t recognize it immediately, though they do recognize that something significant has happened. That’s one of the pleasures of Beagle giving older characters the lead in Summerlong. Beagle tells a kind of story that feels unusual to me in fantasy and science fiction, though it is common in more mundane settings. His characters are neither young people discovering who they are, nor old ones either looking back or having one last adventure. Instead, they are mature people, rounded and complete in themselves showing new sides of themselves or finding different ways of being who they were all along. It begins with a discussion in a restaurant about what steps Joanna (Delvecchio, whom Abe often calls Del) should take to keep the gray from taking over her hair, and the two of them pulling the server into their conversation. Joanna’s gray is forgotten already. Wheels are turning. Her name is Lioness. She’s new at the restaurant, and has been staying at an attached spare room, but it is cold and she can’t get warm no matter what she does. Abe and Joanna learn this and a bit more when they invite her over to continue the conversation after all the other diners have left. Abe has a garage where he sometimes brews beer, it’s warm enough with a heater plugged in. He offers it to Lioness, who says she will come out the next day when the restaurant takes a break between lunch and dinner service. The rest of Summerlong is finding out. Soon enough, Beagle introduces Lily, Joanna’s daughter from a previous marriage, who is grown enough to have finished college and be several steps into her career, but who has not settled down, moving from one unsuitable girlfriend to the next. She and Joanna have a complex relationship that Beagle captures as readily, as eloquently as he does the deep understanding between Joanna and Abe, shown in small gestures and conversational asides far more than in any grand proclamations. Abe and Lily have a much less fraught tie than that between mother and daughter; he has been more than an uncle, less than a step-father, and they adore each other without and of the driving each other crazy that years of proximity can cause. One sensible step at a time after that first conversation with Lioness, the ties among the four of them become more complex. She’s both amazing with people and somehow out of step with everything. Abe, Lily and Joanna become more themselves around her, but even that upsets their equilibrium. And when some of Lioness’ past starts to catch up with her, the three of them find themselves in unexpected situations that bring up parts they hadn’t known, or had long forgotten. 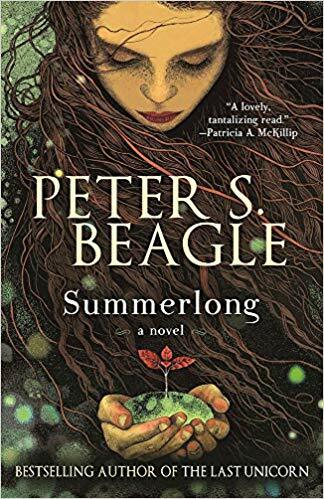 If there is a flaw in Summerlong it’s that as a reader of previous Peter S. Beagle books, I fully expect that Lioness is more than what she seems at first, and I am prepared to accept a magical or supernatural explanation for the events that transpire. In fact, I am more willing to look for the fantastical element than the characters themselves are, and that pulled me out of a the story from time to time. Abe and Joanna want to find rational explanations — although Beagle does not belabor this point — where I was fine saying that yes, something very unusual is happening. It’s not a major mismatch between book and expectations. When confronted with incontrovertible evidence, Abe and Joanna decide to roll with what is happening, but I did have a bit of the sense that Beagle hoped his readers would be at least as skeptical as his characters. It’s a gorgeous book, all Summerlong. The people are lightly funny, clearly drawn, rounded. They meet the unexpected, both in the world around them and in themselves, and come out changed by more than just the passage of the seasons. Even the warmest, most glorious summer ends.